This is a presentation I did for the Cambridge WordPress meetup. 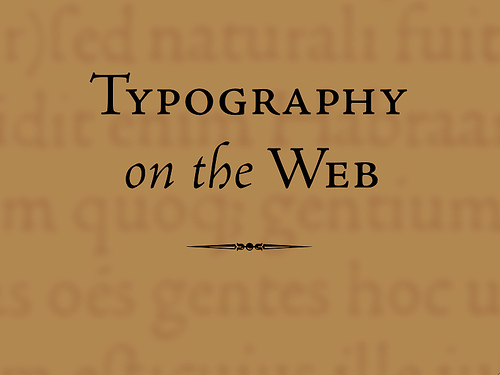 It is quite an indepth look at typography on the web. Native fonts live on the user’s system. Since they are already on the user’s computer they will display instantly. Be careful though, as fonts available on one system may not be available on another. For example the font “Helvetica” is available on OSX (Macs), but not Windows (PCs). Adobe TypekitInstead of calling the font files from your own server these are called from a separate service. Because all systems have default fonts for all these categories we should specify them as backup fonts in our “font stack”. 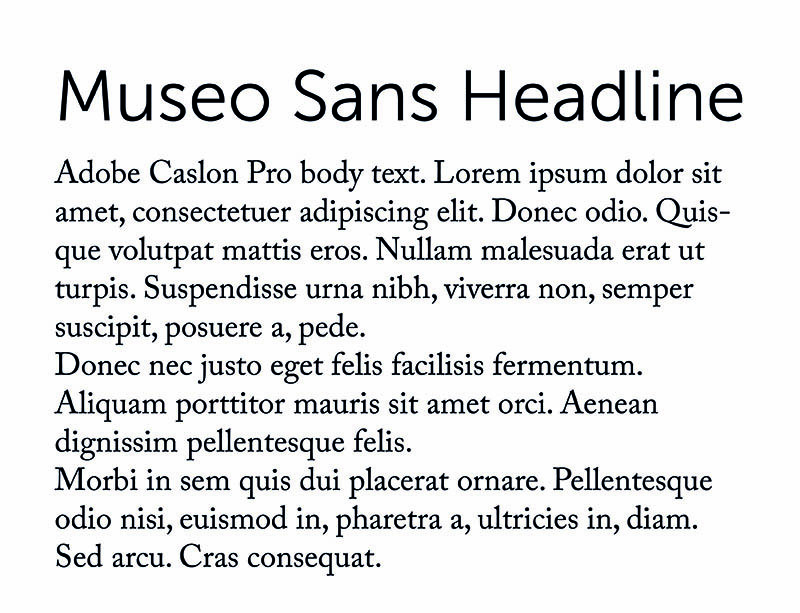 Is an example of a font stack for Helvetica Neue. This typeface in available on modern Macs but may not be available for older ones. If the typeface isn’t found we default to Helvetica, then Arial (the Windows equivalent of Helvetica) and finally sans-serif. Check http://www.cssfontstack.com/ for example font stacks. This is important because when we use our own fonts we still need a font-stack so that the user still gets a useable typeface if ours fails to be delivered for whatever reason. 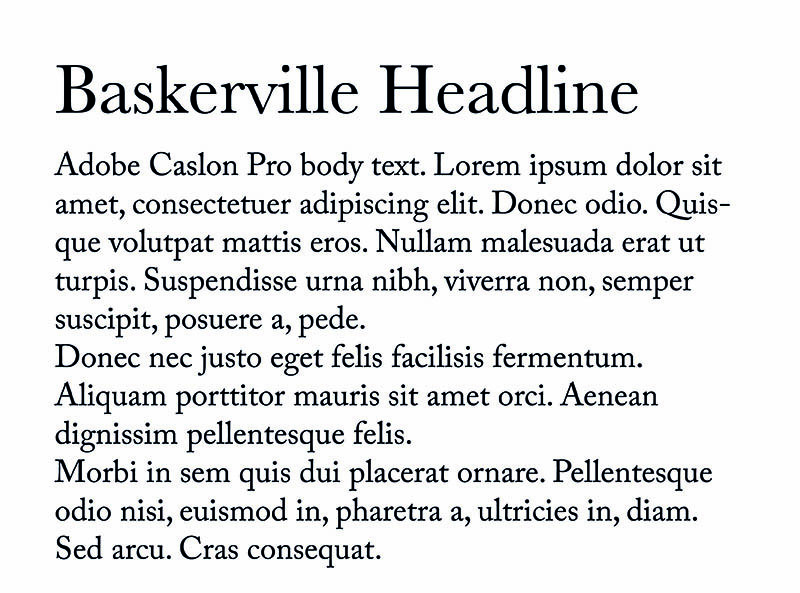 Baseline: The line the type sits on, note that descenders dip below this line. Also for reasons for optical perception the curve of an “e” or “o” also slightly dips below this line. This is because a letter “o” looks odd if it sits exactly on the baseline. x-height: The distance between the baseline and the top of a lower case “x”. This is important because the relationship between a letter’s x-height and the cap-height affects how readable a type is. There are many different font styles but an obvious place to start is between serif and sans-serif fonts. Serif fonts have extra features such as brackets and finials on the end of strokes. Before the Victorian age almost all typefaces were serifs. Sans-serifs first emerged in the Victorian age primarily as a advertising form. However they really came to prominence in the 20th century during the modernist period. Both forms have their uses and although sans-serifs are being used more and more, serifs still have a big role to play, especially for long form reading, as I shall discuss below. In this example you can see Bree may appear to be a nice typeface. But the eccentric “g” and “f” would quickly becoming irritating over the course of reading a long document. Calluna, on the other hand, still has nice features, but would be comfortable for longer reading. The extremely big x-height works as part of display advertising, but won’t be suitable for long form reading because scanning a line of text is difficult when the letterforms are a near uniform height. 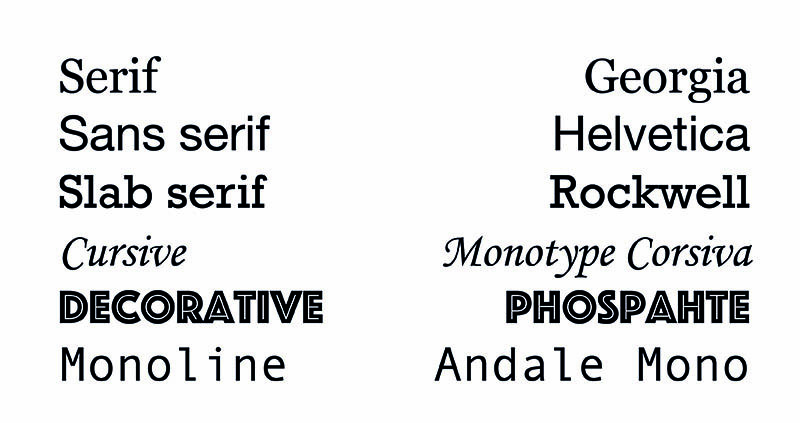 Contrast reflects the degree of difference between the thin and thick strokes of a typeface. Sans serif fonts like Helvetica tend to be quite uniform, meaning there is no or little difference in stroke thickness. 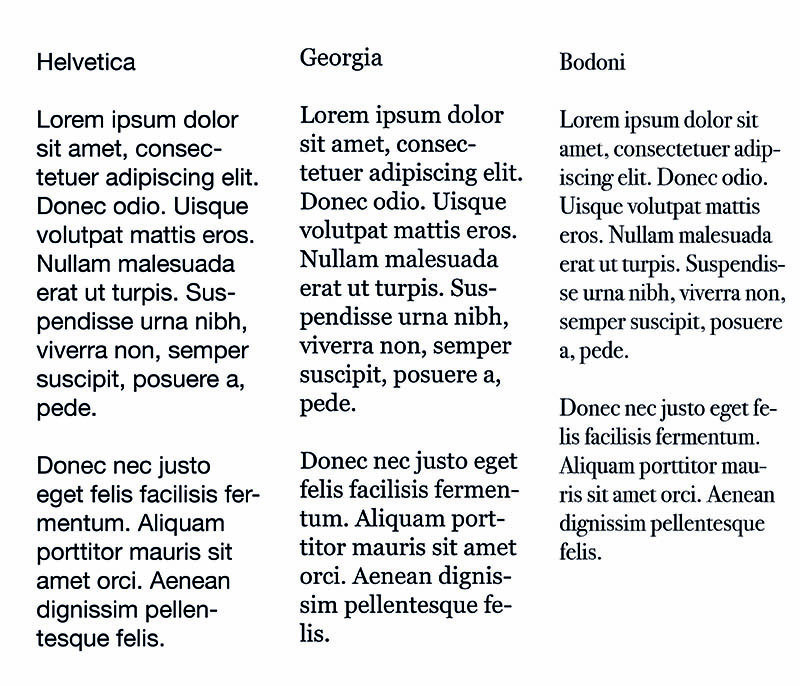 Serif fonts tend to have more contrast, and some, such as Bodoni, have extreme contrast. It has become a trend to think that uniform sans-serifs are somehow more “professional” and “modern” than serif typefaces. But there is a reason why novels and newsprint tends to be set in serif. By having contrast and serif features like brackets these typefaces have enough differentiation between letterforms to aid the reader and make the experience smoother. Therefore it’s common practice to pair serif body text with sans-serif headlines or vice-versa. A better font pairing. It is clear that two different type styles have been chosen. By mixing a sans-serif with a serif a clash of serif styles is neatly avoided. An Em is a relative sizing method. by default 1em is set by the browser to 16px. 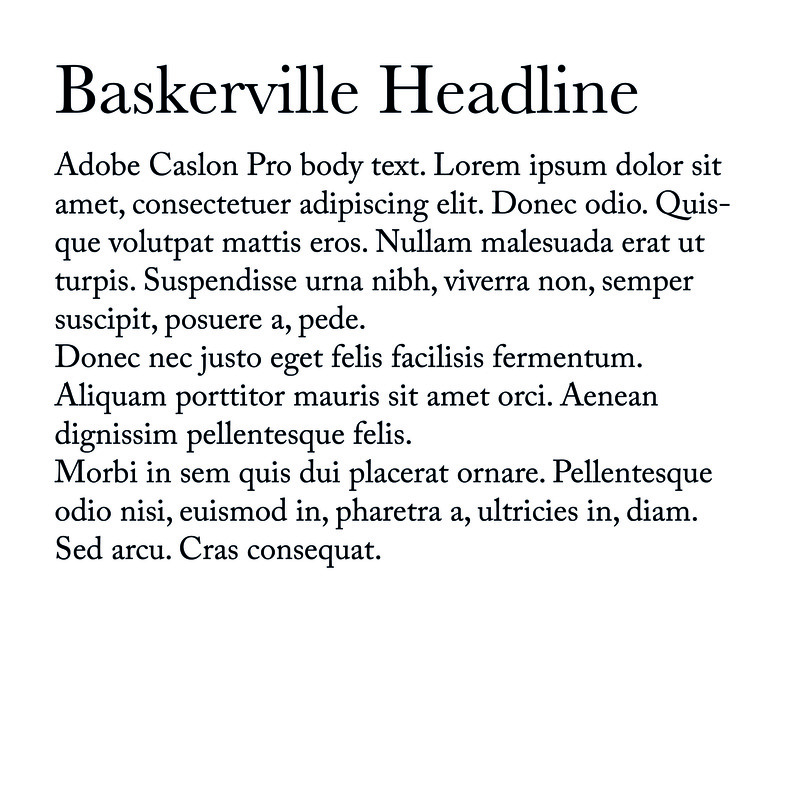 You can then use this to set other typographic elements relative to an em. The first school is to do everything by eye. So for example using 16px as a base double the size for a sub head and double again for a headline size and adjust it until it looks right. The other school suggests using a typographic scale to provide a mathematical base for the scaling of type. 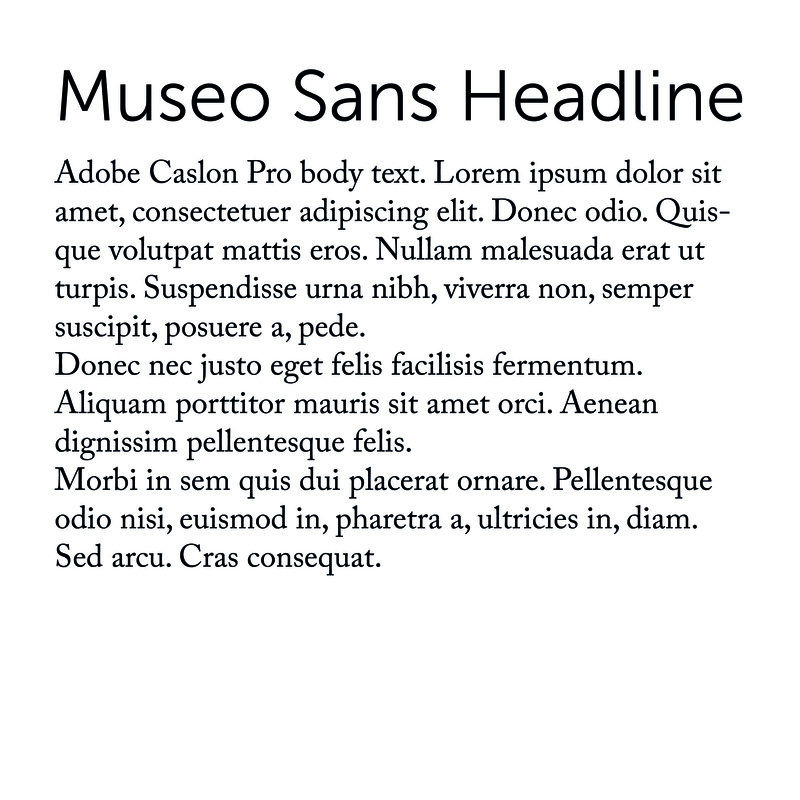 An old rule from print typography is that the measure (line length) should be between 45 and 75 characters, so adjust your text boxes to accommodate this length. Ideally aim for something in the mid 60s. The line height is the distance between lines of text. There is no magic number as to what this should be because it depends on the fonts descenders, ascenders and things like the font weight. Generally the longer the line length the more line height you need to make it more comfortable for the eye to move between lines of text. Neglecting measure is super common on websites, but it’s easy to fix. 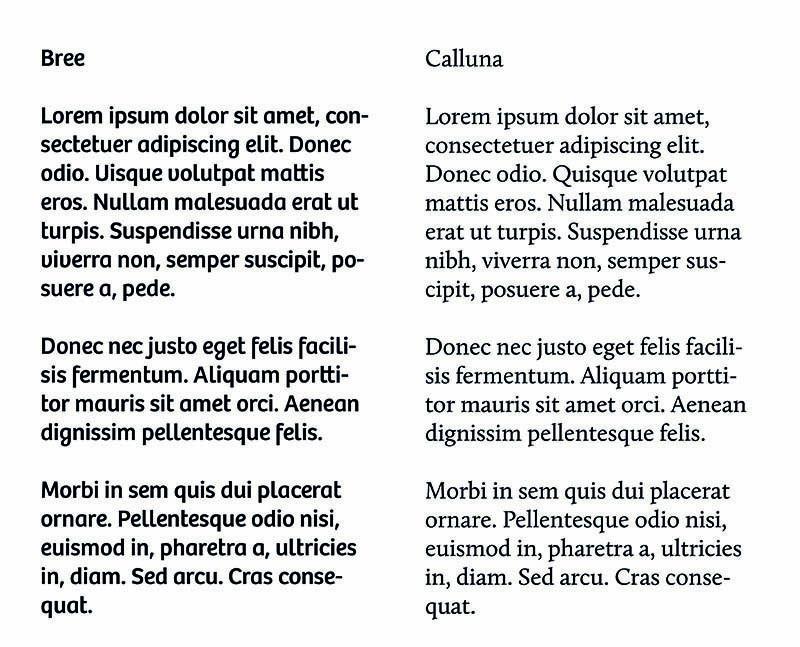 In products like Adobe InDesign there are a host of options to handle hyphenation which don’t exist in css. Because of this is often best to avoid hyphenating text on the web. Therefore, unless we have a generous measure a left justified / ragged right setting is usually best. This avoids rivers in our text. On a desktop people are usually reading text from about an arm’s length away. On a phone or tablet, however we generally read from a closer position. Therefore we can reduce the font size a bit to compensate. This has the added advantage of increasing our measure slightly. The measure will always bit a bit short on a mobile, but again we can compensate by decreasing the line height a bit.